We have a regular dentist that we’ve been using. They claim they will call us every 6 months for a cleaning; however, I have noticed that the only time they seem to call us is during the season when they don’t have as many patients, such as rainy season. Since we are paying for CAJA and they have a dentist there, I decided it was time to use what we are paying for! Steffi was kind enough to allow me to borrow Ana Cecelia to go with me and show me the ins and outs of getting an appointment. We arrived about 6:45 a.m., yes, a.m., to stand in line to get an appointment. Appointments are given out starting at 7 a.m. There may have been 10-12 people in front of us, but a lot more behind us. I had our cedula’s, carnets, and receipt of payment for July. When it was our turn, Ana Cecelia just handed her the carnets. Never asked for current proof of payment or our Cedula’s. So, just like that, we both have dental appointments for July 16th. WOO HOO!!! Before I left to meet Ana Cecelia, Mark had asked when I thought we’d get an appointment….I figured it would be great if it was August or September. I realize our age got us earlier appointments. Just a little side note: I’ve never seen so many people walking around holding their jaw as if they were in pain. Pretty sure extraction was in their future. All in all, a huge thank you to Steffi for letting me borrow Ana Cecelia; was fairly easy to do; standing in line and waiting is just part of the Pura Vida life! Our car actually has A/C!!! Comments Off on Our car actually has A/C!!! For probably a couple of months now, I’ve been telling Mark that something is wrong with the A/C in the car…..and of course, this falls on deaf ears, because it’s just “me”. Well a week ago, Mark had the oil changed in the car and while waiting he was thumbing through the car manual….please keep in mind that our car manual is in Korean, NOT English or Spanish. Since I don’t think he reads Korean, he must have come upon an illustration that indicated that there is a filter for the A/C….in the glove compartment. He said it was packed with dirt….we live on a dirt road…doesn’t surprise me it was full because I was sure something was wrong with the A/C. The first time I drove the car after getting the filter “blown” out, I could tell a significant difference in just backing the car out of the drive-way. Those clever Koreans and their illustrations! At any rate, it’s wonderful now….and I even don’t have to have the A/C on the highest setting….. Headed into town shortly after noon today to go to the Post Office and a few other places. Stopped at the P.O. and voila! I had a small package…..so exciting! There were 4 males and one female in the P.O. laughing like crazy. Two of the men were laughing so hard, their shoulders were shaking – you couldn’t help but giggle at them. I have no clue what they were laughing at; but, it was infectious!!! Smiles were all over in the P.O. this afternoon. Then I headed to Dra. Victoria’s to get my glasses adjusted. She was really busy!!! Saw Julie and Norman next door at Dennis’ and Gerardo’s….said they had finally recovered from Bunky’s party on Monday. Then on to Coope…as I was checking out, the checker grinned and acted like she was sniffing the air – you could hear raindrops on the roof; not enough to get anything wet, but they were raindrops. She broke into a broad grin and explained that when she was pregnant, she loved smelling the rain because everything smelled fresh! Yep, I understood what she was communicating! A Pura Vida day for sure! 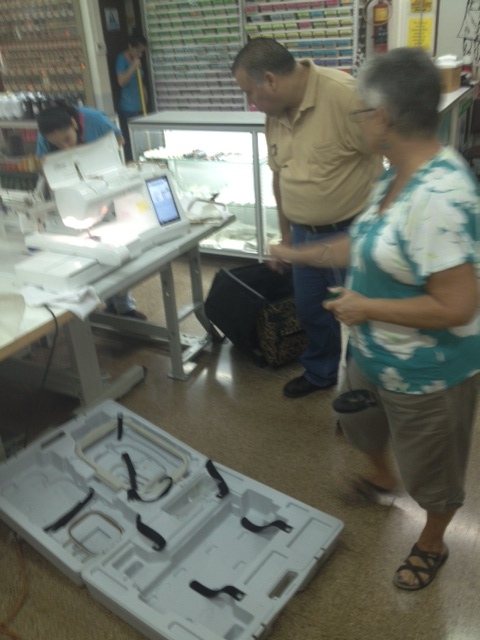 Found a great sewing/embroidery machine repair shop in Alajuela, Costa Rica. About a month or so ago, my sewing/embroidery machine started acting up; not all the time, just every once in awhile; it seemed to be only when I was using a USB for embroidering. Then this week, the light bulb went off and I thought, why not try a design that came with the machine. It didn’t work either. So after much researching on the internet, we ( yep, had to get the husbter involved in finding this), found some machine repair shops that worked on Brother sewing machines; my machine is a Babylock Ellisimo, which is the same as the Brother Quattro. Pat, one of our friends that is fluent in Spanish, made the call for us to see if they worked on my type of machine. It was a yes and it will be diagnosed while you are there. So today, we headed to Alajuela (there is one in San Jose, also) to check it out. When we walked into this shop, we were both astounded at what we saw. Seems like every machine imagineable was there! 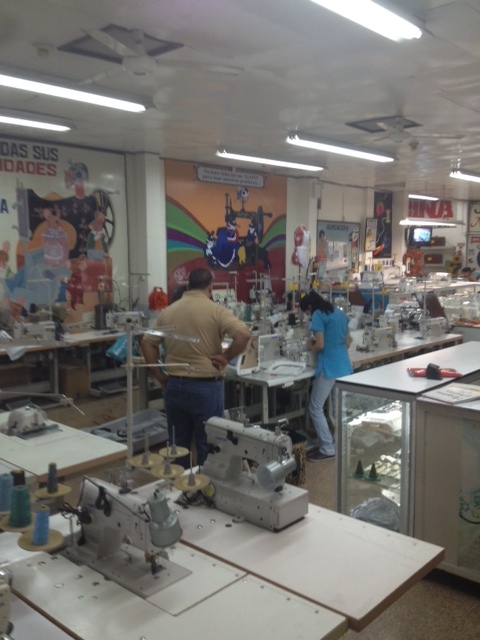 From basic sewing machines to fancy embroidery machines with many needles, to sergers, etc. This is a picture of the store front – the repair shop is also located there – and get this, there is a Singer repair shop that’s attached to the repair shop – so it’s a 3 – stop place! And quite easy to locate also. The “machine doctor” says it looks like you have a virus and it needs to go to the electronic dept. which he will take care of . It was just unbelievable seeing all the machines they had available for sale. There were all kinds of parts available in the display cases….Mark says he wishes auto mechanics carried such an inventory here! At any rate, we both felt a sigh of relief when we walked in and I had no qualms about leaving it. Now to wait for it to be repaired. I will most likely be in the states when that happens, but call me Miss Pollyanna, I’m holding out for sooner, rather than later. They had extra hoops for sale, all kinds of scissors, glue guns, glue sticks, thread, lots and lots of thread. 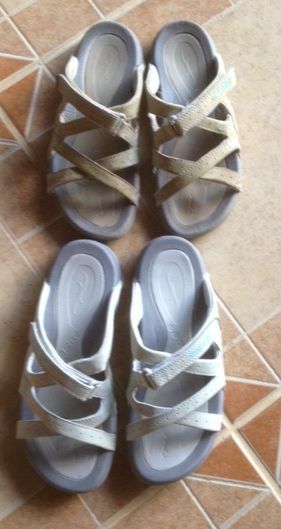 They also had 3 machines for sale called The Butterfly….from China, of course. However, the machines looked like old Singer machines and were even in wooden sewing machine cases/tables for around $300. I made the comment that I’m almost tempted to buy one of those so I’m not without a sewing machine! I should have taken a picture of his face and the look I got….it was one of those priceless moments! Then we headed to Jalepenos – Normans in Alajuela for a great lunch. 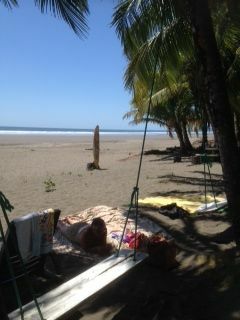 Pura Vida for now – I’m a really happy camper having found La Bobina!